During TwitchCon this past October, Bungie stated that they'd start up special events again once the second season for Destiny 2 kicked off in December. 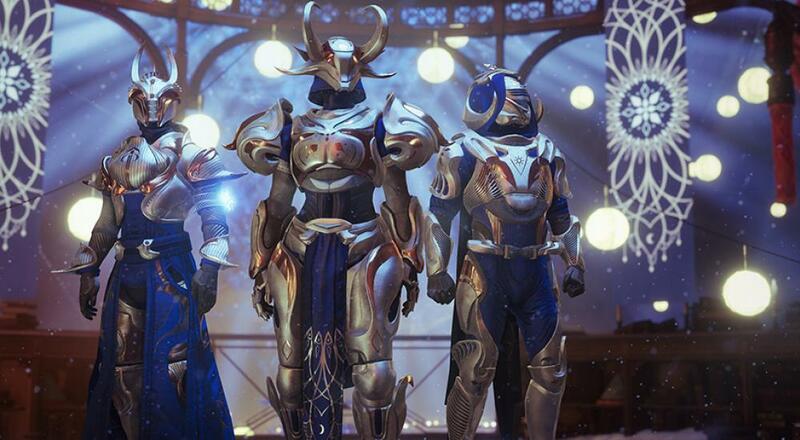 Today, players can enjoy some winter-y themed activities as "The Dawning" arrives in the Tower and Farm, and offers up some special gear that will be available for a limited time. The Dawning event starts today, December 19 at 12:00 pm EST and comes to an end at roughly the same time on Tuesday, January 9, 2018. It's open to all players regardless if you own the recent "Curse of Osiris" expansion or not. There will be a special weekly milestone added to the list of activities during this time, and completing that milestone will reward you with a special Dawning Engram that can be redeemed at Tess Everis' shop for some Dawning-themed gear. In addition to the gear, the "Mayhem" variant returns to the PvP-centered Crucible, and players will find piles of snow in Strikes that let you hurl snowballs at foes and stun them. If you're looking for an excuse to hop back into Destiny 2 for a bit, then here it is. We'll have our Co-Op Review of the title as it stands now as the year comes to a close later this week, so be sure to check back in to read our thoughts on how the game fares. Page created in 0.4315 seconds.